Graduate students sexually harassed or assaulted by a faculty member have the option to file a claim with the Title IX office.But Hillary Lazar said a graduate student union would help hold Title IX and the University accountable, pressing the office and the administration to investigate these types of cases more fully. A panel comprised of Lazar and four other students gathered and answered questions from 12 students in the Posvar Colloquium Room Friday as part of an event hosted by the Council of Graduate Students in Education. The event aimed to inform students about unionization efforts and provide a place for them to voice their concerns. Sexual harassment was among the concerns graduate students discussed during the panel. Beth Shaaban — an organizer for the Graduate Student Organizing Committee and one of the panelists — said a 2015 study by the Association of American Universities found that one in 10 female graduate students at 27 large U.S. universities was harassed by a faculty member and that 53 percent of these harassers were serial offenders. Shaaban also said training for Title IX at Pitt is not mandatory for staff and students — which she said could be taken up with the administration by a union. The Graduate Student Organizing Committee has pressed forward with their campaign to unionize graduate students at Pitt since they publically announced it January 2016, hoping to eventually gain enough support for a vote in February 2018. The University came out against the union in a letter composed by Provost Patricia Beeson and released this past July. The letter indicated the University’s concern with how a union could negatively affect relationships and communication between students and faculty. Shaaban, a doctoral epidemiology student, said this letter may have made some grad students wary of what they say around faculty and administration, but overall it helped garner more awareness of the situation. “It’s possible it will be sooner than [February 2018], but it has to be by then because we initially started collecting cards a year ago,” Shaaban said. 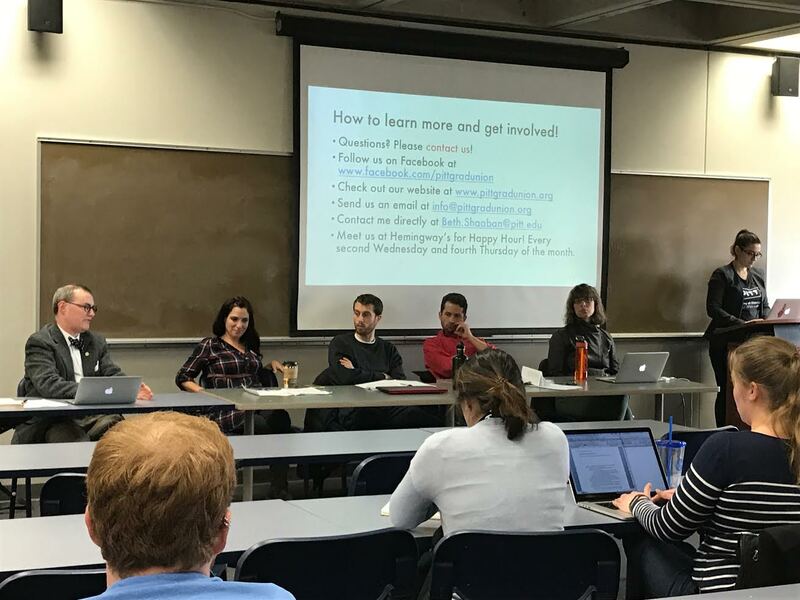 Organizers hope a union will address a number of grievances — including sexual harassment policies and wages for graduate students — which were discussed at the panel Friday. Panelists and attendees also discussed the Republican tax bill and its implications for the unionization efforts. Katelynn Kelly, the president of CGSE and a fourth-year doctoral student, said that while the bargaining process is going on — which happens after a formal vote for a union is held — graduate students will already be affected by the Republican tax bill. The Senate bill — which passed the U.S. Senate late Friday night with a 51-49 vote — still has to be reconciled with the House version of the bill. The House version treats tuition waivers given as compensation for work — such as teaching undergraduates or performing research — as taxable income, but the Senate version of the bill lacks this provision. If the final version of the bill includes the provision and passes into law, it will affect some 145,000 graduate students. Lazar said she had similar concerns as Kelly, particularly because she has a 1-year-old son. Robin Sowards, an organizer and researcher at United Steelworkers, said if the Senate bill passed — which it did soon after the panel — then the organizing committee would take graduate students’ concerns to the administration. “Once the bill is passed … then we’ll know what the actual damage is. We’ll go to the administration and demand that they address it to think through what the most fair and financially sound solution is,” Sowards said. Shaaban said GSOC’s primary goal is to get higher wages and have in-state and out-of-state tuition reduced because of the tax increase. At the end of the panel, Shaaban encouraged attendees to join the committee or talk to the organizers about their concerns. Lazar said the union would provide an appropriate platform for students to express concerns independent of the University. “This is our movement. These are our grievances. This is our voice,” Lazar said.